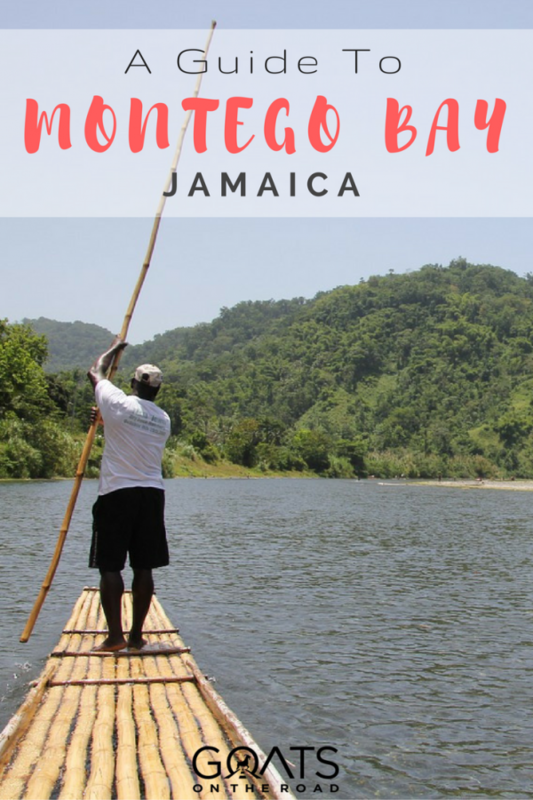 Many people consider Montego Bay THE epicentre for tourism in Jamaica, and with so many things to do in Montego Bay, it’s not hard to see why. 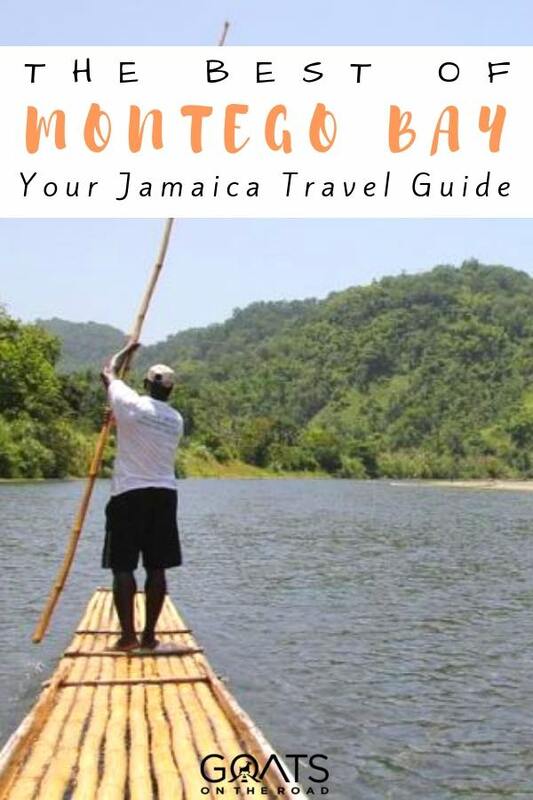 The home of the original all-inclusive due to its beautiful sandy beaches and epic turquoise waters, Montego Bay remains the core of the Jamaican traveler’s experience and really is more than just a line in a Beach Boys song. One of the best things about this small Caribbean island is the diversity in things to do in Jamaica. Montego Bay acts as a microcosm of these amazing activities. Activities that bring visitors face to face with beautiful scenery, thrilling adventures, intriguing culture, delicious food, and that true Jamaican ethos of ‘irie‘. 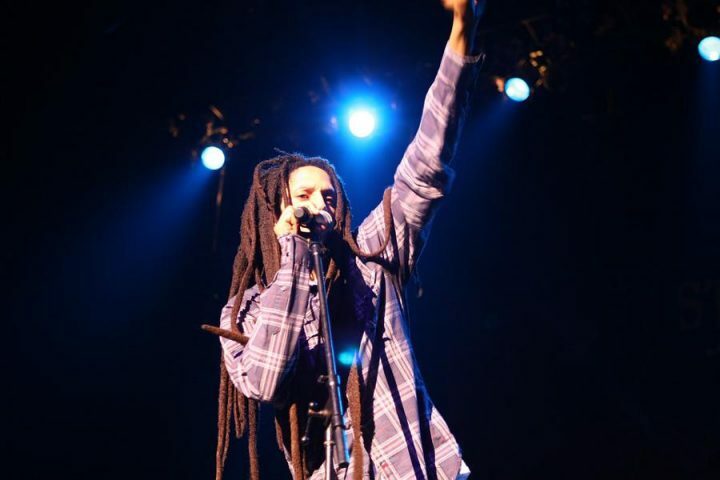 Started in 1978, Sumfest is the ultimate Reggae music festival in Jamaica every year. It attracts Reggae artists from all over the world, but is a true showcase of Jamaica’s trademark music genre. Normally occurring between late July and early August, Sumfest is more than just a music festival. Theme parties and fashion shows pop up all throughout the weekend and a food stall of delicious Jamaican grub is never far away. Speaking of Jamaican food, a trip to the island is not complete without a tasting of real Jamaican jerk. Jamaicans take their jerk very seriously, and not all jerk is created equal. Roadside stalls are often the best places to sample the national staple, so brush off any fears you may have of street meat. If your jerk chicken doesn’t come wrapped in tin foil, you’re not doing it right. One of the best places to get jerk in Montego Bay is Scotchies, the prefered eatery for any local Jamaican. 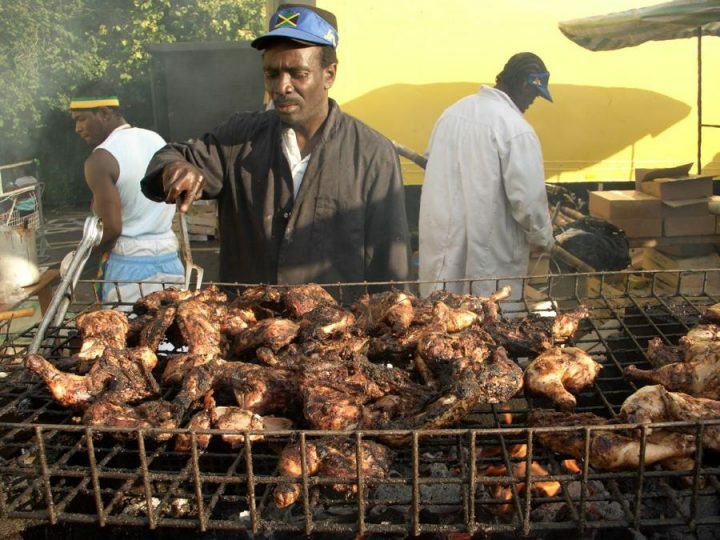 Scotchies is a classic jerk stand, with chicken, pork, fish and seafood on the menu, as well as many sides to choose from. All tables are outside under the palm frond thatched eves, and despite the odd location, a trip to Scotchies is always worth it. Try the roasted sweet potato, not only is it locally grown, but cooking time and technique softens those snacks to perfection. Eating real Jamaican jerk is definitely one of the top things to do in Montego Bay – and Jamaica as a whole! 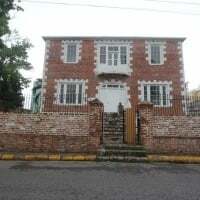 Just east of Montego Bay, Rose Hall is seeped in both historical fact and ghost story lore. 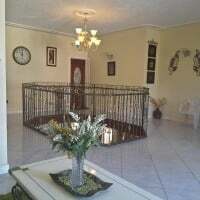 This great house sits on a historical plantation complimented with natural gardens and a beautiful pond. The plantation house has been returned to its glory days and serves as an example of the time. 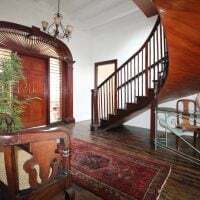 What draws most Jamaicans’ interest to Rose Hall is the folklore attributed to the property. It is said that the proprietress of the estate, Annie Palmer, still haunts it. Rumoured to have murdered no less than four of her husbands (or slaves she took as lovers, semantics were fluid back in the day), Annie is one of the more fascinating characters in Jamaican history, though the truth of the stories remains debated. 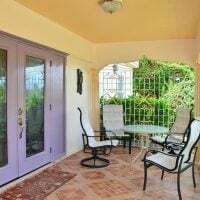 The most famous of all the Montego Bay beaches, Doctor’s Cave Beach is right in the heart of the Strip, and some may argue it is the true birthplace of Mo Bay tourism. Often busy and perhaps too full of hustlers, Doctor’s Cave Beach is nonetheless one of the best beaches in Jamaica, if not the Caribbean. 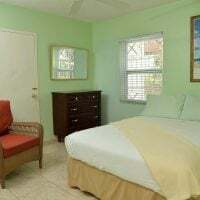 The private bathing club which was founded by the beach’s name sake is still around, and amenities at the club and the nearby Casa Blanca hotel can be rented. However, it’s not for the budget traveller in Jamaica. Many travellers dream of riding a horse through the waves of the Caribbean Sea. 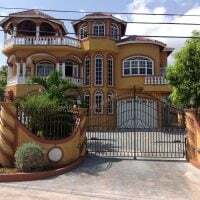 In Montego Bay, that dream can be a reality. 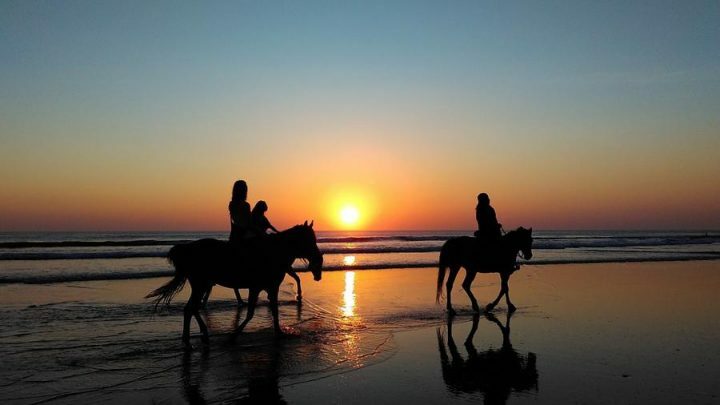 Ride through gardens on a retired race horse with Half Moon Equestrian before reaching the soft sands of the beaches. Swimming along the softly crashing waves atop a well cared for horse is an experience that really can not be matched in many other beach destinations! The Jamaican version of rafting is not the white water type. In Jamaica, a rafting trip down a river, especially one as scenic as the Martha Brae, is a chilled out, luxurious cruise on a bamboo float. This is for sure one of the more relaxing things to do in Montego Bay. 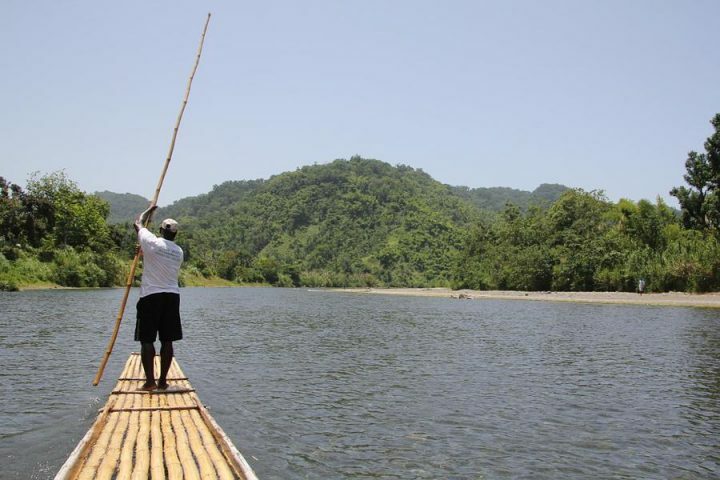 Steered by a local professional, rafting down the Martha Brae is a must do for any visitor to Jamaica’s North Coast. It’s also a great way to see Jamaica’s jungle and hear the local oral history. Despite the promised sunshine, it does rain in Montego Bay every so often. An option for those rainy days is a visit to the Montego Bay Civic Centre where one of the best museums in Jamaica lives. The small museum is housed in a 2002 Georgian-style building. 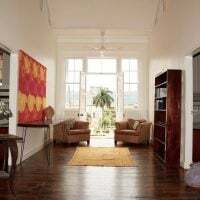 It stands as the only museum in Western Jamaican that speaks to the history of slavery, the plantation economy and lifestyle, and the resistance of the mid-1800’s. The National Gallery West is also located on this site. A branch of Kingston’s National Art Gallery, this small one room exhibit of Jamaican art is quickly appreciated. 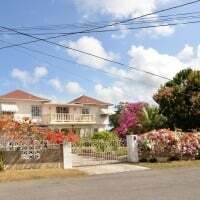 Here is a list of the top 3 rated, affordable properties in Montego Bay. 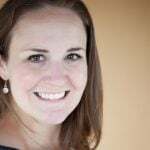 Click on the links and check them out for yourself! One of the more fascinating things to do in Montego Bay, Jamaica’s Glistening Waters is located about an hour east of Montego Bay in Falmouth. Visiting the Glistening Waters requires a night-time trip to the Luminous Lagoon. This is a natural phenomenon that occurs where the Martha Brae River meets the Caribbean Sea. The water, due to the mixture of fresh and sea microorganisms, reacts to movement by either boat or humans, and glows a brilliant blue light when disturbed. This phosphorescent activity is one of only 4 places on the planet where such a marvel occurs, and the only one where it can be experienced all year around. 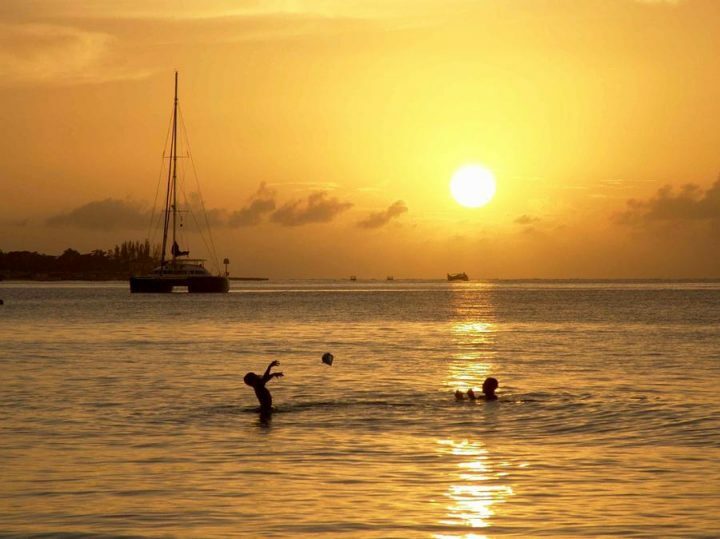 Most hotels in Montego Bay will run evening trips to the Glistening Waters, as it must be experienced after nightfall. Alternatively, taxis can be chartered to take visitors directly there and back again. Try the chocolate cake in the small bar at the boat dock. Trust me! Typically, I am hesitant about cultural tourism. I worry about exploitation and that someone’s culture is being either watered down or ballooned to appeal to an outsider’s taste. The Rastafarian religion is one of the more misunderstood religions in the world, and the Indigenous Rastafarian Village actually does a very good job of explaining the truths and the realities. Moving beyond the stereotypes, a 2-hour tour of the wooden ‘village’ which includes a drumming circle and a medicinal garden, weaves the visitor through the history, beliefs, and modern-day existence of Rasta. Learning about Rasta, and the intersections of music, nature, love, and lifestyles, deepened my understanding of Jamaica and definitely did away with some of those clichéd stereotypes. When you’re looking for things to do in Montego Bay, put a trip to this Rastafarian Village on your list. 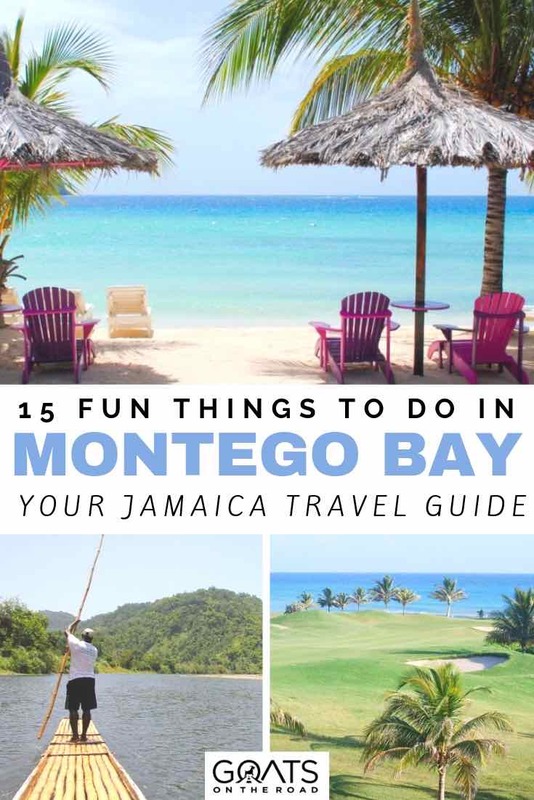 As the original tourism haven, Montego Bay was also the first area in Jamaica to start building golf courses (though the oldest golf course in the Western Hemisphere is actually in Mandeville, Jamaica). 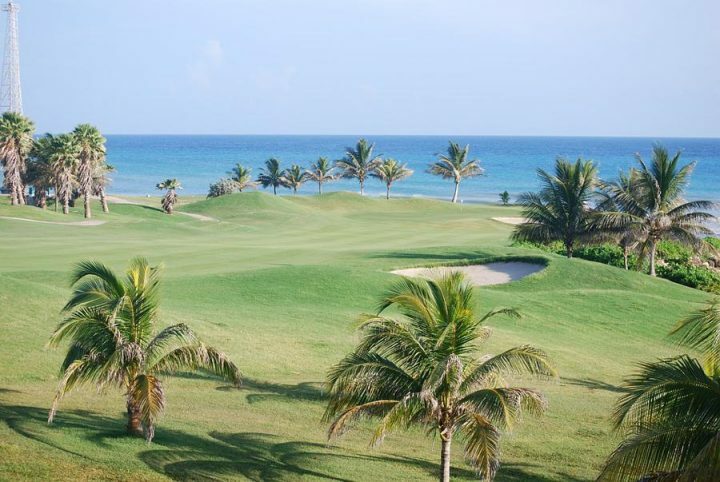 There are ample options in the Montego Bay area for hitting the links. Many courses offer world-class fairways, stunning ocean views, and excellent dining for after the game. Jamaica is a year round golf destination, and several resorts in the Montego Bay area offer packages, all-inclusive experiences, and golfing day trips. In particular, the Rose Hall Great House Golf course offers the best views of the sea from the 16th and 18th tees. And maybe the Witch of Rose Hall will help your long game. Surrounded by turquoise sea and calm currents, Montego Bay is a water lover’s heaven. Scuba diving, snorkelling, jet skiing, deep-sea fishing, and sailing are all options to get off the beach and enjoy the water. Most hotels can set visitors up for day trips, or the tour operators can be approached directly. Hitting the water is one of the best things to do in Montego Bay! My pick for a beautiful island experience is the sunset cruise on a wooden sail boat with the MoBay Undersea Tour company. There is no better way to enjoy the end of a beach day than with a glass of wine, a sunset backdrop and the quiet wind as your guide. 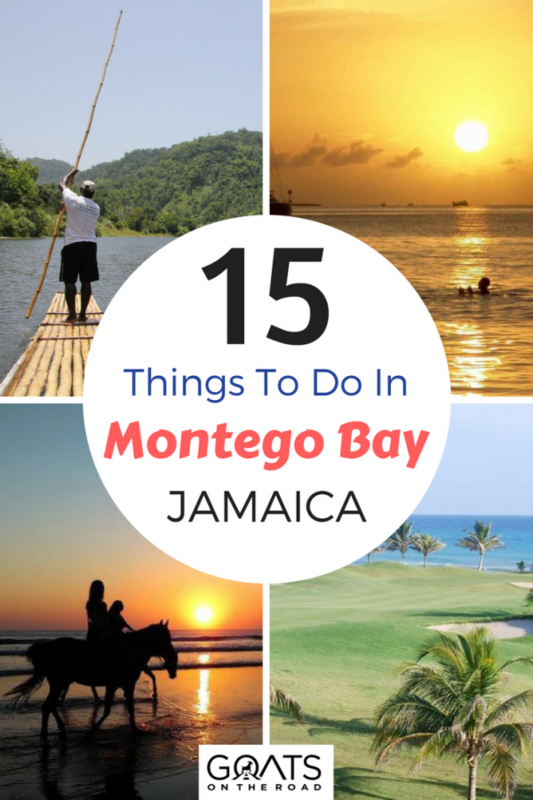 Montego Bay is the tourist mecca of Jamaica and always has been. A massive variety of accommodation, dining, fun experiences, day adventures, and opportunities to relax are only some of the major draws to the area. 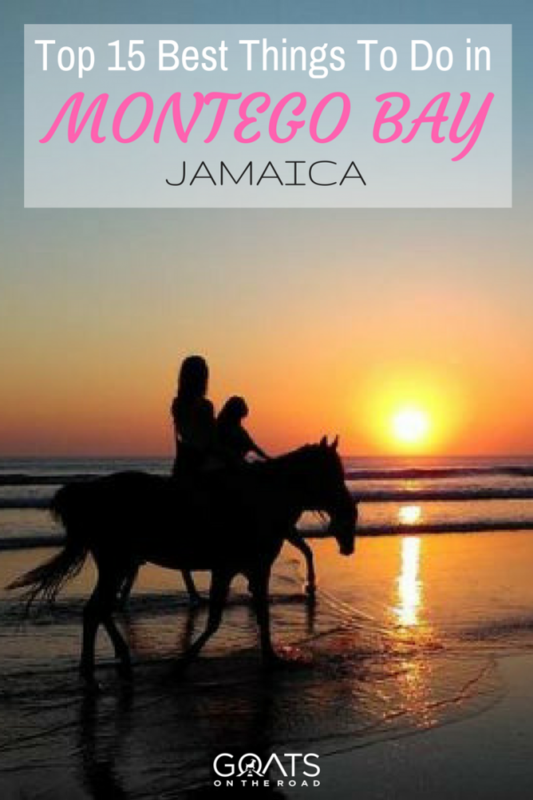 Don’t forget to learn a bit about Jamaican life and culture, as the rich history of the island is unique and deep. Mo Bay is also a great launching point to explore the rest of Western Jamaica. Negril and its beautiful Long Beach is only 90 minutes away, while Cockpit Country, Jamaica’s rugged jungle interior with endless caving and trekking possibilities, is only an hour south of town. As a word of caution, parts of Montego Bay are definitely overly touristic. The Strip area is saturated with tourist shops, tacky restaurants, and folks looking to take advantage. But don’t let those potentially negative interactions sour the experience. Many local Jamaicans are glad to have a chat about where you’re from, tell you about life in Jamaica, and generally relax for a while. After all, that is the definition of living the Jamaican irie life, summed up by Mr. Bob Marley when he sang Don’t Worry, Be Happy! Such a helpful guide. It’s really a very wonderful destination to visit! the photos look absolutely beautiful… You shared awesome information. Thank you so much for sharing. Wrong! Bobby McFerrin wrote the song seven years after Bob Marley’s death. Marley never even heard it let alone sang it!